An estimated 35 million workers are expected to miss work as part of the country's first national strike since 1996. Workers across Brazil on Friday are participating in the country’s first national strike since 1996 in rejection of the unpopular labor reforms, which contain controversial measures that could undermine the power of unions and collective bargaining agreements. Public transportation across the country came to a halt effectively paralyzing mobility across much of country. The strike, which began in the early hours on Friday morning, includes the support and participation from virtually all major sectors of the economy including banking, education, industry, and agricultural workers. Early Friday morning protesters staged road stoppages along major streets and highways preventing access to major airports. 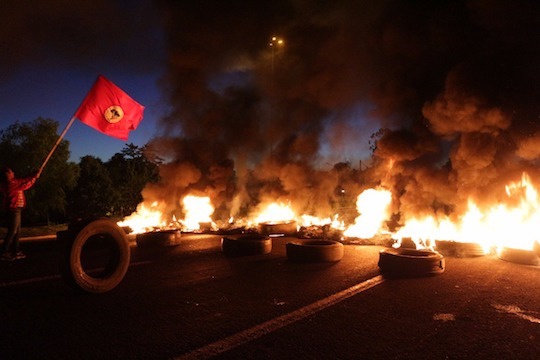 Meanwhile, Brazil's most powerful social movements and labor federations have called for additional demonstrations to take place later this evening in major cities including São Paulo, Rio de Janeiro and the Brasília. According to a recent survey carried out by the polling agency Vox Populi, 93 percent of Brazilians are against the proposed pension reform and 80 percent are opposed to an outsourcing measure contained in the country’s legislative labor proposal. The Brazilian labor movement fears that the labor reform bill would lead to deteriorating working conditions with measures that would allow employers to reduce workers’ salaries while increasing their work hours. Labor experts also warn that Michel Temer's labor agenda could delay Christmas bonuses, eliminate transportation to worksites and scrap meal voucher programs for outsourced workers. In efforts to resist these controversial proposals, workers in major cities across the country are taking to the street to demand stronger workers’ protections as conservative legislators prepare to reverse 20 years of positive gains in the labor sector. 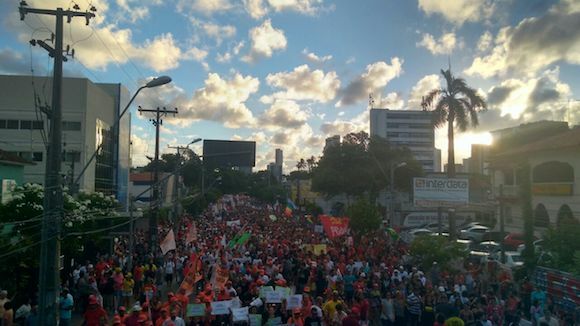 President of the Unified Workers Central (CUT), Vagner Freitas, anticipated that more than 35 million workers will be absent from work, in what he is predicting to be the largest labor strike in the country’s history. The strike was largely organized by CUT along with the Workers Party of Brazil, former President Dilma Rousseff’s political party. 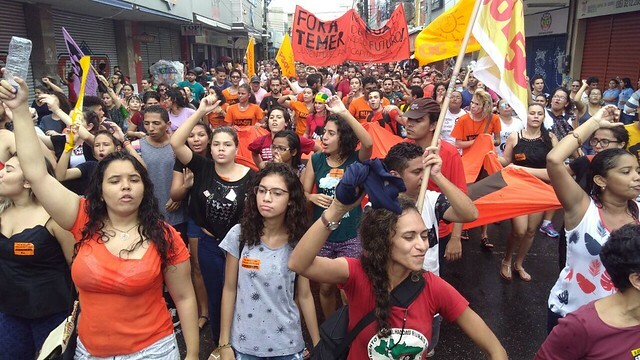 The mass mobilization of workers and civil society also takes place amid separate ongoing protests against proposed austerity measures by President Temer who is also proposing a 20-year freeze on public spending and cuts to pension protections. The proposal would limit government expenditures over the next two decades so that it is reduced in proportion to country’s GDP, which critics argue would translate into a tremendous sacrifice for the poor in exchange for a reduction in public debt. The general strike comes amid a dismal disapproval rating for the Temer administration — a staggering 87 percent, according to the latest Ipsos poll.